How Can I Disable Geo Services on my Vantage Site? Previously, “Google” maps was the only option available that could be integrated with Vantage. After feedback from our valued customers and the recent cost associated with Google maps, the AppThemes team has worked on adding additional Geo Services. Each Geo Service is available as an addon extension. This allows you to set up maps on your Vantage site with a Geo Service of your choosing. Geo Services can be found within their own menu. Click on Vantage and then on the Geo Services menu. Depending on which free/paid Geo Services Addons you have, you may see only one page, or you may see a number of different tabs. Under the General tab is where the basic Geo Services configuration will take place. Choose your Geocoder Provider from the drop-down menu. The options, other than Google will relate to the Geo Service Plugins you have. Choose the Distance Unit that suits your site, either Kilometers or Miles. Enter a Search Radius. Leaving this field blank will mean the radius will be automatically calculated based on location query. Choose a Maps Provider. The options available will be the direct result of the plugins you have on your site. Select your Marker Color and view the map preview. 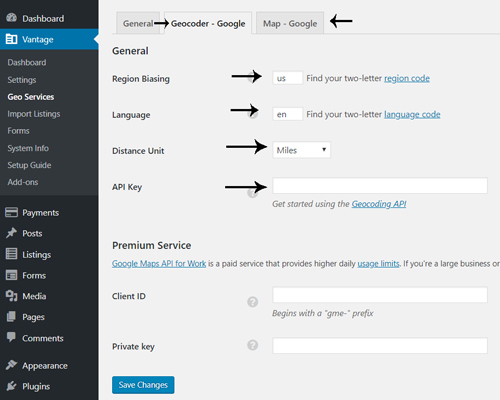 If you decide to use Google as the Geocoder and maps provider of your Vantage site, the following section will help you to set it up correctly. Click on the Geocoder – Google tab. Choose your Region Biasing. For example, ‘US’ for the United States or ‘IT’ for Italy. This helps to locate where your customer is posting an ad from. Choose you Language Code. For example, entering in ‘EN’ represents English. This will be the language used to display locations and other information on the map. Choose the Distance Unit – either Kilometers or Miles. Enter in your Google Maps API Key. You can read more about setting up your Google API Keys here. Click on the Maps – Google tab. Complete steps 2 – 5 within this tab. Choose a maps Color Scheme. Installed Geocoder Providers: This option determines which “Geocoder” will be used for the AppTheme. A geocoder takes a given address and converts it to geographic coordinates. All available installed geocoders will be listed in the “Providers” drop down box. Google is the default provided with the theme and the only option available without the addition of a plugin. Distance Unit: Allows you to select Kilometers or Miles as the desired unit of distance for your site. Default Standard Location Search Radius: Sets the default value for search radius when searching by location in the AppTheme. For example, if a user searches for a Listing/Event in Toledo, Ohio, then the search result will display listings or events within 100 miles radius on Toledo. If the “Distance Unit” was set to kilometers, then the search radius would be 100km. 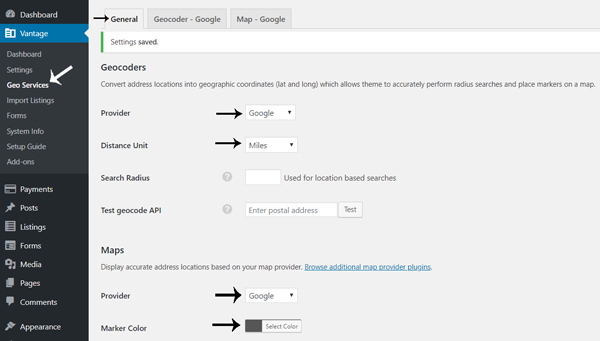 Map Provider: This setting allows you to select the Map Provider used to display maps on your AppThemes site. Google Maps is the default Map Provider provided with the theme and the only option available without the addition of a plugin. 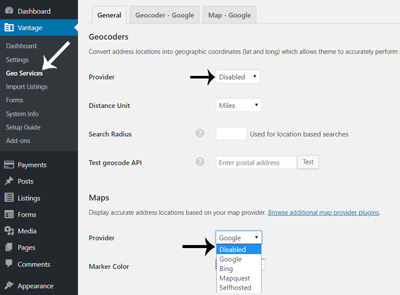 If for any reason you do not wish to display maps on your Vantage website you can use the following section to disable maps and geocoder services. Click on the Vantage menu and then on Geo Services. Within the General tab, you will see a drop-down menu for the Geocoder Provider and for the Maps Provider. Choose the word “Disabled” from both drop-downs if you wish to disable Geocoder and maps or just from the provider you wish to disable. What Will Happen if I Disable Maps on my Vantage Website? The map will disappears from the Ad sidebar. The link to Google Maps site is still there while the ad still has coordinates. Search location autocomplete will be disabled with the map. Location field will still appear and will accept addresses for location search. If Geocoder is enabled – it will do request from the backend on the page load. This will work similarly as how it works with auto-suggest, except it will automatically take the first available address option (regardless it correct or not). If Geocoder is disabled – it will search for given location value in the ad Country, State, City, Postal Code and Street values. What Will Happen if I Disable Geocoder on my Vantage Website? Geo-coding on ads import/create/edit will not work. Ads will not have coordinates. There will be no link to the Google maps site. Location search using auto-suggest and Geocoder will not work for such ads (they need ad coordinates). Search by location will still available, but it will search for given location value in the Ad Country, State, City, Postal Code and Street values. Below you can find two examples of maps provided by Bing and Google Maps. These screenshots were taken on a website where the ClassiPress AppTheme was used. Adds a one page author website to your Vantage theme. 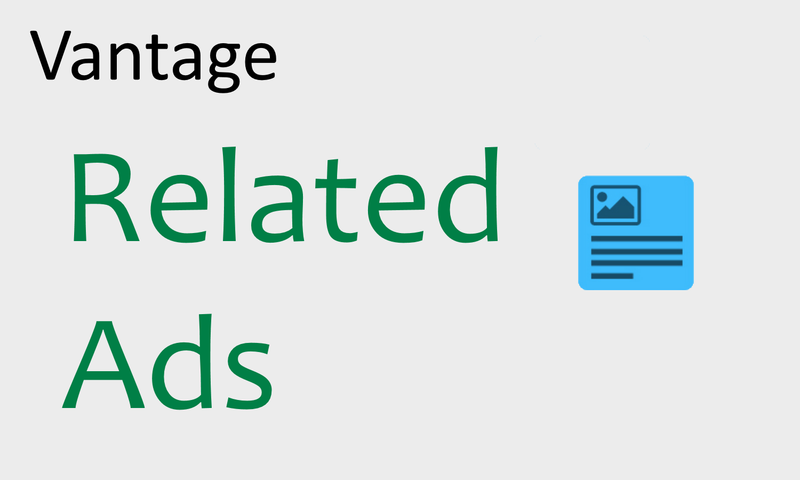 Add related ads blocks on your Vantage listing pages.